This series began with an introduction and important questions. Once you have these questions figured out, you can begin the actual creativity. As I said, these steps can occur in any order, as inspiration hits us all at different moments. The important thing is that you're thinking about these things, and recognizing how one affects the other. If you don't plan on playing this army, ANY system is an option! 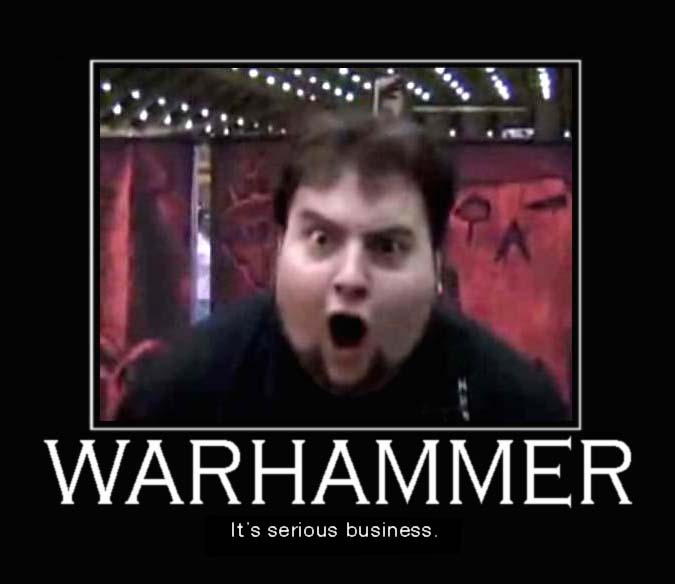 If you still want a playable army, maybe this is an opportunity to try a new developer (like Privateer Press) with your friends, or to play at a local club. Try to find somewhere you can watch and perhaps try some games of the new system before investing if you are interested in playing. + You've got TONS of models. - They don't do much by themselves. + You can afford to lose models. - Your tactics need to involve losing those models. + Your soldiers are all very powerful. - Every model lost is a tragedy. - You crumble when you're hit back. No matter what system you're looking at, you'll probably find that armies have similar styles across platforms. 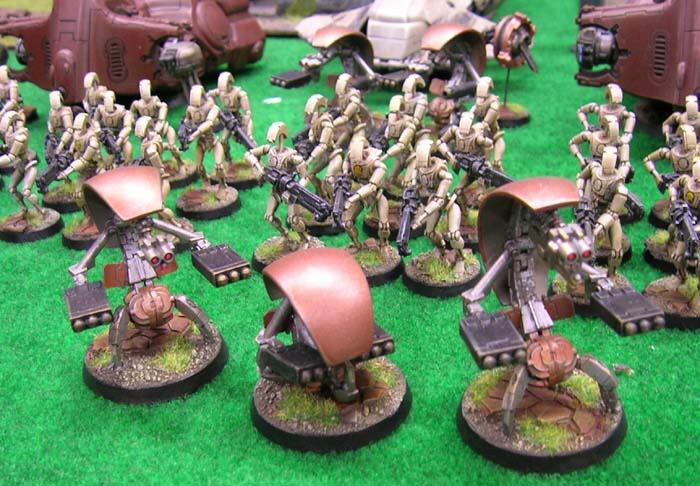 If you're changing systems, will you look for an army that plays similarly to your current army, or do you take this opportunity to try something different? This will be influenced a number of ways. Competitive gamers will research and build a list. 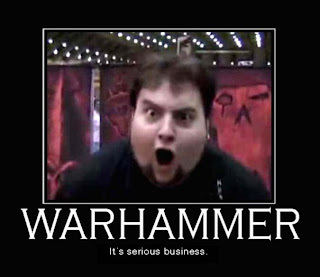 Being unfamiliar with an army, expect to spend extra money later as you buy more units. These armies can still look good, but the focus is on picking models that work, not those that strictly look awesome or look great together. Casual gamers might pick an army based on background. (fluff) Great stories can really make a game. This'll have a mix of both style and play-ability. Casual to Non-Competitive people will often be artists who might just pick what "Looks cool together." These armies might not even be legal to play, which is ok - army composition can make a nice looking bunch of minis that'll sit on a shelf somewhere. Now that the Army and List stuff is out of the way, lets get creative! By now you've looked around at other systems and what the the various forces in each look like. Has this given you any ideas? Did any of them jump out at you and say "You would have a blast painting me!" I encourage you to choose an army based on something that makes you feel passionately about working on them - that'll help keep you motivated to work on what will be a time involving project. 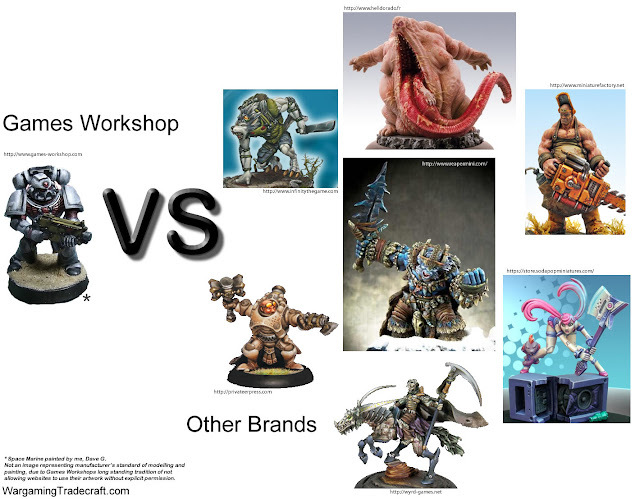 Keep this image of your ideal army in your head as you work out the finer details. Keep notes. If it helps, make a word document and fill it with screenshots from around the internet of things that you'd like to incorporate into your design. Even the worst sketch or stick figure can help jog your memory of an idea you had... and it beats forgetting what you wanted to do. 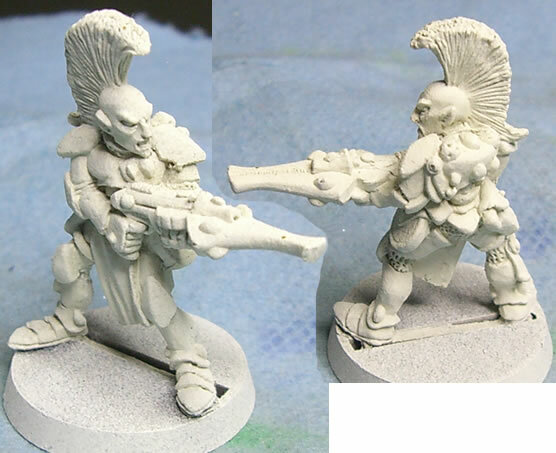 There are different ways to sculpt and paint your army, and all will create the final look of your force. All your units should be painted similarly to keep a flow across your army. These armies will usually have a very clean and detailed look as the artist tries to recreate the army painted in an example of it's prime. 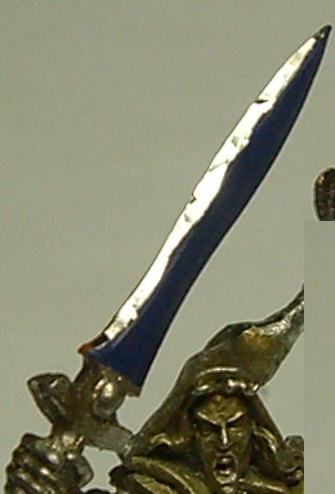 There are still opportunities to mod these minis as you pose them in dramatic ways, but could be as simple as finding a unique way to paint them that stands out. 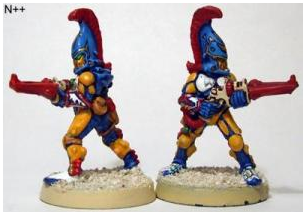 Perhaps a strong looking Ultramarine force, with it's chapter colours flying boldly or a pristine Eldar host with vibrant colours and armour made into shimmering metallics using iridescent paint. 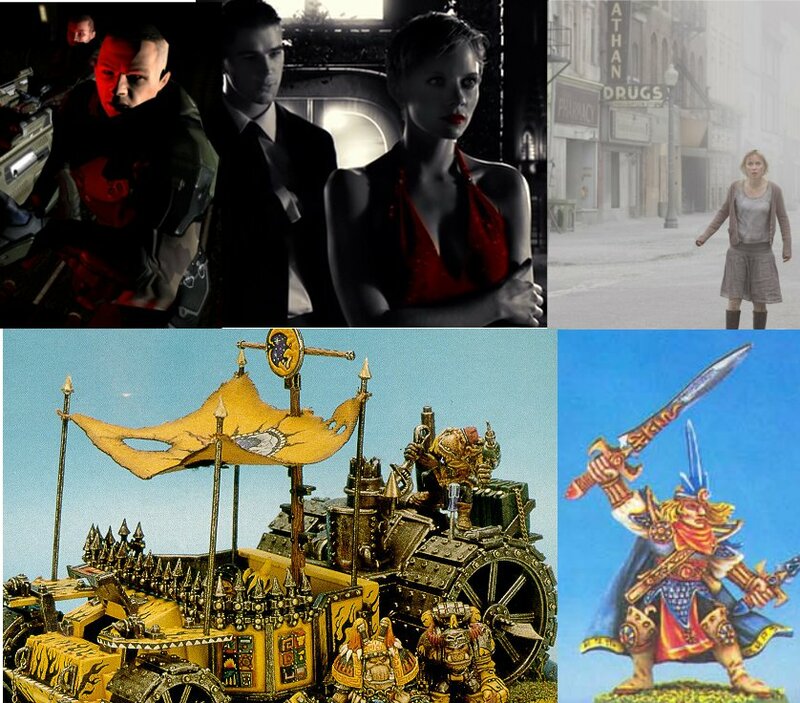 These are armies similar to the ideals, but based on stereotypes the game system has created. Rather than just painting the standard army colours, you're creating a subsection of an army that will be reflected in the list you build or show. Perhaps an Ork player wants to create a Speed Freak army and focus on a whole bunch of junky but sporty, pieced together, suped up vehicle heavy force. 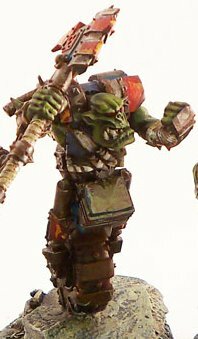 You can take it a step further, like Goatboy did for the Heroes of Armageddon, and modified even walking Orks to blend in with the theme of the rest of the force. These are armies based on some kind of concept, idea, rumour or hint from within fluff. Not necessarily creating a fluff-based army list, but something smaller and more specific that influences how it looks. 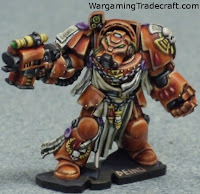 If you've read some of the Dark Angel novels, you'd know that the white Deathwing armour is an old tribal custom of their people - spreading white ash on themselves before entering combat and group of marines are given this rite in one of the stories - Imagine painting an army of Space Marines that look like they're covered in ash? 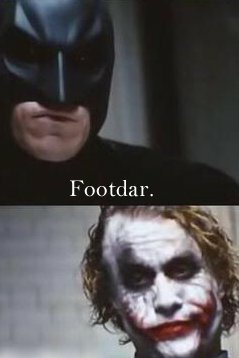 Inspiration can strike from many different sources. This applies something in pop culture, history, etc, to the game world and runs with it. Paint up an army of marines to look like the Crimson Lance from the video game Borderlands. In addition to the paint job, you can create custom equipment like the storm shield that Terminator is using - styled after the riot shields in the game, instead of using the normal ones. This is an example that should even be WYSIWYG legal, since it's obviously a shield. It's your army - do what you want. Just make something that looks good to you and you enjoy building. Make up your own colours, replace models for things they're not supposed to be, bring fantasy themes to sci-fi or take post-apocalyptic / steam-punk tech to fantasy, etc. Who says Orc/ks have to be green? Plan your creations out ahead of time using notes, doodles, etc. There's a few different levels you can get into here. These are smaller changes you make to your models for aesthetic reasons. Finer details make models stand out from something bought off the shelf. 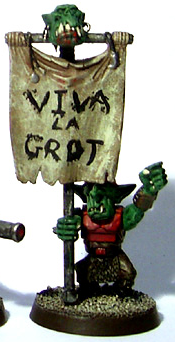 AKA, put a little love into your army instead of just painting them. Chips in armour, extra antenna, guns from older editions, replacing weapons to make them WYSIWYG, etc. Rather than just smaller changes to your minis, conversions include serious cosmetic changes to make models look drastically different than what they were before. A little trickier to be game-legal, but these armies can be quite a fun time. A converted army means you've turned the system on it's head a little and applied your own ideas to already existing rules. These could mean heavier duty modding of existing models to repose them. Or changing their look by replacing a few key things (like their heads) to give them a different theme. Perhaps instead of using Tyranid rules you wanted to play as Imperials and converted an Imperial army into a Genestealer Cult, full of the expected mutations and limo-tanks. 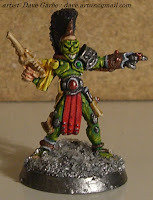 Or maybe you want to create an Exodite Eldar host and use a mixture of elf-like models from other systems like Warmachine's Retribution, or even Fantasy lines. For those who want to just blow all the rules out the window and do something completely different. Always try to think of ways around anything in your way - but to do so, you need to be aware of the problems you'll face. Love WYSIWYG or hate it, some scenes require it in normal play, as do most tournaments. You may have to ensure your models still have all the appropriate wargear. 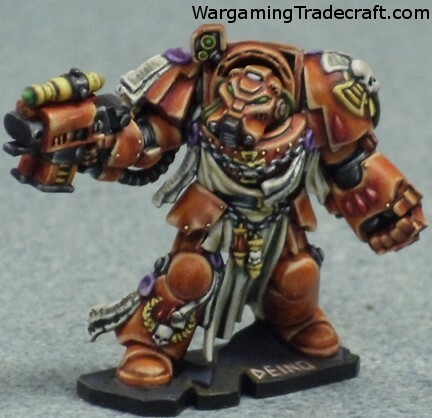 Some models are such a hunk of metal/plastic/resin that physical limitations will make it impossible to cut an arm away from a body or do some other mod you want. These take a lot more work - which is OK, if you're up to it. You might have to destroy an arm held close to a chest, and replace it with an arm from another model, or use another model entirely and mod it until it looks like the one you want. Similar colours give individual models an incredible look. Be it dark and gritty or light and more washed out. These models will look amazing up close, but can blend together on a battlefield. By contrasting colours, you can make models really jump out from the battlefield, but they might not look as uniform or nice up close. Strong shadows and bold highlights go a long way to create some nice contrasts. This also lends to a uniform and realistic look across an entire army. 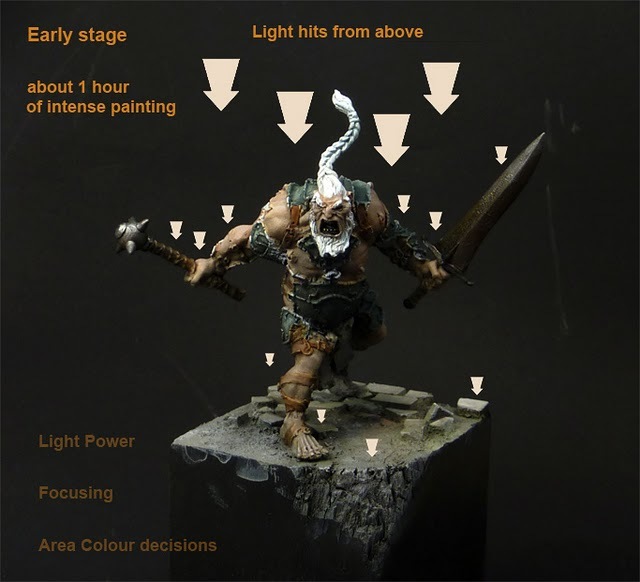 Most painters give their armies a normal highlight using colours with more white and aren't too attentive to the direction the light is coming from. Some armies would look quite nice and very unique by painting them as if there's some other light source affecting them. Will you light all your models from a similar angle? What colour is the light source? Those standing in lava fields or with electricity buzzing around them. Perhaps underground armies in tunnels lit by yellow torches, green ooze or blue fungi. 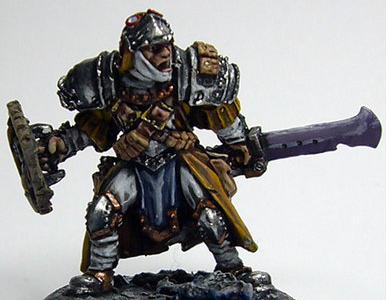 This can make a pristine army look aged, weathered, roughed up, experienced and more realistic. 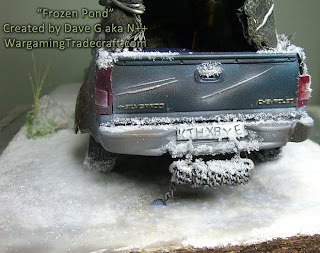 Yet another easy task to make models look more than just toys off of a shelf and stand out from what other people are creating. Mud covering the feet and leggings of troops as well as the bottom sections of tanks, Necrons rising after centuries from a watery planet and are covered in rust or Desert Raiders covered in sand. Cutting chips out of armour and weapons, breaking off antenna, slicing oozing wounds into skin, etc. 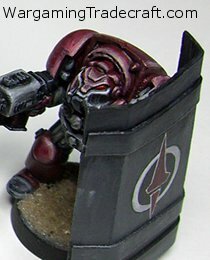 Also, Finecast modelling defects don't count as "battle damage"
I just want to say that I'm really enjoying this series. I would have some sort of intelligent comment to make, but this morning's reading is brought to you by the letters S and L (for Sleep, Lack Of). Yeah a great series indeed. I'm getting heaps of value out of these articles. Excellent work! This was quite inspiring. I also like the little finecast dig at the end haha. Great article! really enjoying this series. And used in a great article too. 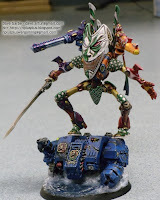 @Speedfreak: I hadn't see that army until I was hunting pics for armies I had seen around - I had to include it because it looks great!